As we pause to celebrate Veteran’s Day, GRDA also wants to recognize the many members of its current and retired workforce that previously served in the United States Armed Forces. As we approach Veteran’s Day 2018, the Grand River Dam Authority once again is using this space to recognize a significant portion of our workforce that once served in the United States Armed Forces. Today, they are electric linemen, mechanics, relay technicians, plant operators, engineers, police officers, office employees and much more. Yesterday, they were soldiers and sailors, airmen and marines. Today, they are at work in power plants, in bucket trucks, in offices and shops right here in Northeast Oklahoma. Yesterday, they were on ships, in tanks and stationed at military bases around the globe. Today, we are proud they are here with us and we are proud to call them our coworkers. Roughly ten percent of the current GRDA workforce is comprised of military veterans. Meanwhile, many GRDA retirees also served in the military before beginning their careers with our organization. 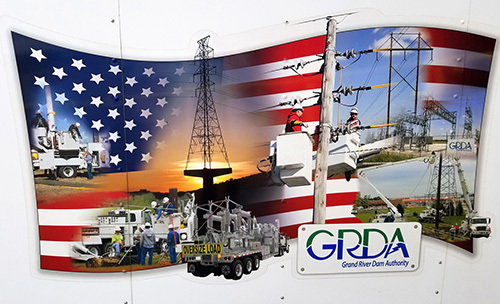 Down through the years, the experiences, expertise and devotion to duty demonstrated by these individuals have helped GRDA to accomplish its 24/7/365 mission for Oklahoma. With the skills learned in the military, these men and women have helped to build and operate electric generation and transmission assets like dams and substations. They have also helped to guide the Authority on a daily basis in hundreds of different roles. Their service to the country continues to benefit GRDA and the state of Oklahoma today. So, once again, as we pause to celebrate Veteran’s Day 2018, we salute our veteran workforce including those with us today and those who are now enjoying retirement. Thank you, Team GRDA!